Thomas Jacobs, AIA has been with Krueck + Sexton Architects for 17 years and was named a principal of the firm in 2011. The recipient of the 2012 American Institute of Architects’ prestigious Young Architect Award, he is a graduate of the Swiss Federal Institute of Technology (ETH) in Zurich, Switzerland. Previous to joining Krueck + Sexton, he worked with Herzog & de Meuron. Tom’s approach to architecture is rooted in the belief that recognizing the need is the primary condition for successful design. He is devoted to clients, and to the ideal of the architect as steward of the environment. An advocate for community development, planning, and sustainability, Tom is the co-founder of Architects Advocate: Action on Climate Change, a nonpartisan grassroots network of architecture firms nationwide. Tom is an adjunct associate professor at the Illinois Institute of Technology where he has taught graduate and undergraduate design studios, as well as the seminar “Good Business Is Good Design”. 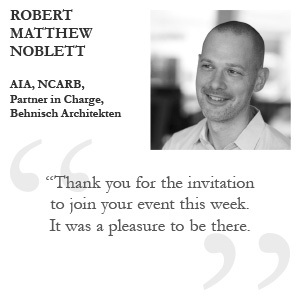 He has lectured at academic institutions, architectural conventions, and civic organizations, integrating his experiences as a practicing architect, teacher, and advocate.